Infantile hemangiomas (IH) are the most common vascular tumours of infancy, with an incidence of 8-10% reported globally. The incidence is higher in girls, and premature and low birth weight infants. A majority of the lesions develop within the first few weeks of life, commonly involving the head and neck region (65%), followed by the trunk (25%) and extremities (15%). These tumours are characterised by an initial rapid growth, followed by stabilisation and slow and variable involution thereafter. It is proposed that most of the lesions are to be treated with 'active non-intervention'. However, 10-38% lesions may require treatment in some form or the other. Systemic steroids have been the most commonly used treatment for proliferating IHs. However, inherent risks like Cushingoid features, hypertension, growth retardation, disturbance in the vaccination schedule and osteoporosis limit their use. , Propranolol is an important recent discovery, claimed to be useful in both proliferating and non-proliferating lesions. However, its use is also marred by significant and potentially life-threatening complications including hypoglycaemia, hyperkalaemia and cardiac sequelae. The use of lasers is also limited to a few special situations. Sclerotherapy is an effective modality for localised lesions, with isolated reports available in literature. A three-month-old female infant presented with an exuberant, rapidly growing IH over the right forearm, measuring 3.4 cm × 3.1 cm [Figure 1]a. The parents desired treatment in view of its visibility and rapid growth. As the child was of low weight, it was decided not to use systemic treatment options so as to minimise the associated side effects. Polidocanol sclerotherapy was used with the aim of reducing the vascular bulk of the lesion. The sessions were performed on an outpatient basis. For the first sitting, 1% polidocanol solution was used, later increased to 1-2 ml of 3% solution. The solution was injected with an 18 gauge needle into the most vascular part and distributed to the periphery by manual pressure and massage. Care was taken to avoid spillage into the surrounding skin or any artery. Post procedure, pressure haemostasis was secured and pressure bandaging (to be kept on for another 48 hours) was applied, before sending the patient home. The parents were asked to report any adverse events like excessive crying, bluishness of the surrounding skin, excessive bleeding or systemic complaints. Repeat sessions were performed every two weeks. At each visit, the size, growth characteristics (progressive, stable, or regressing), color (bright red, dull red, bluish, or brown) and consistency (tense, flaccid, or soft) of the lesion were noted. Serial photographs were taken using the standard positioning and lighting. The lesion showed early regression and after eight sessions, most of the lesion was cleared [Figure 1]b. The treatment had withdrawn at this stage and no rebound has been seen after eight months of follow-up. No adverse effects other than mild scarring were noted. A 16-month-old male child presented with a 1.8 cm × 1.6 cm pedunculated, exuberant IH involving the submental region [Figure 2]a. The lesion had been noticed three weeks after birth had progressed to the present size by eight months of age and had remained static since then, not showing any signs of regression. As this was a pedunculated, sac-like lesion, well past its prime, we decided to treat it with polidocanol sclerotherapy directed at the base of the lesion. The lesion showed fast regression and resolved almost completely after three sessions [Figure 2]b. In both these cases, the lesions, being exuberant, were expected to heal, leaving behind fibro-fatty residual sacs, which may have required surgical correction later on. Sclerotherapy produced a marked reduction in the lesion bulk, in a short span of time, giving a more acceptable end result, while avoiding any systemic complications. Sclerotherapy is a simple, easy and effective; yet largely unexplored treatment modality for IH. The sclerosant disrupts cell membranes, causing thrombosis, obliteration of vascular lumina and irreversible damage to the vascular endothelium. Andrew and Kelly were the first to describe its role in IH, in 1932. The first review of this treatment modality was published in 1938, by Kaessler. Sclerosing agents tried in IH include polidocanol (hydroxyl-proethoxy-dodecane, with 5% pure ethanol),  sodium-tetradecyl-sulphate (STS)  and ethanolamine oleate. Polidocanol is the most commonly used in view of its additional anaesthetic effect, low toxicity and low risk of allergic reactions. There are only a few studies showing its use in IH, in English literature. ,, Winter et al., published their experience with polidocanol in 132 patients with cavernous hemangiomas,  demonstrating a good response (a majority of the patients requiring one to three injections only). One of our patients with a lesion on the forearm required eight sessions, probably because of the larger size of the lesion as well as the ongoing growth phase. Winter et al. also mentioned the development of flabby, atrophic areas in three patients, requiring surgical intervention later on. 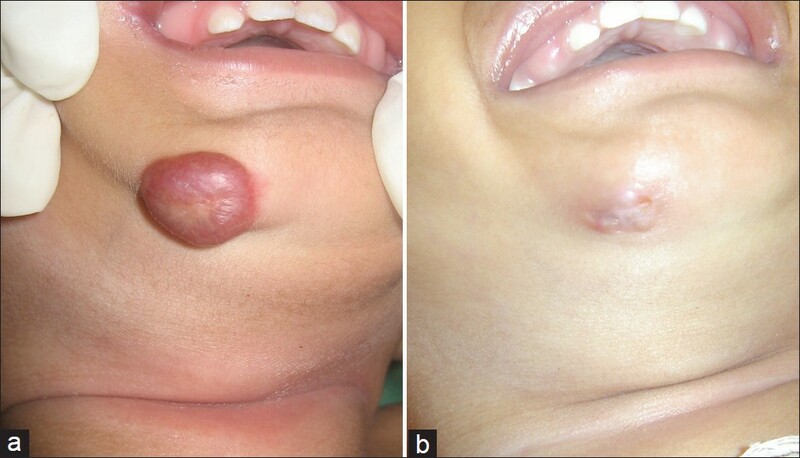 We noted effective and acceptable reduction in both lesions, with only mild scarring in both cases, which was deemed to be inconsequential by the parents. Expected complications with sclerotherapy include hyperpigmentation, transient burning pain, telangiectatic matting, cutaneous necrosis, ulceration, thrombophlebitis, pulmonary embolism or inadvertent arterial injection. Most of these are reported in cases with varicose veins and haemorrhoids. 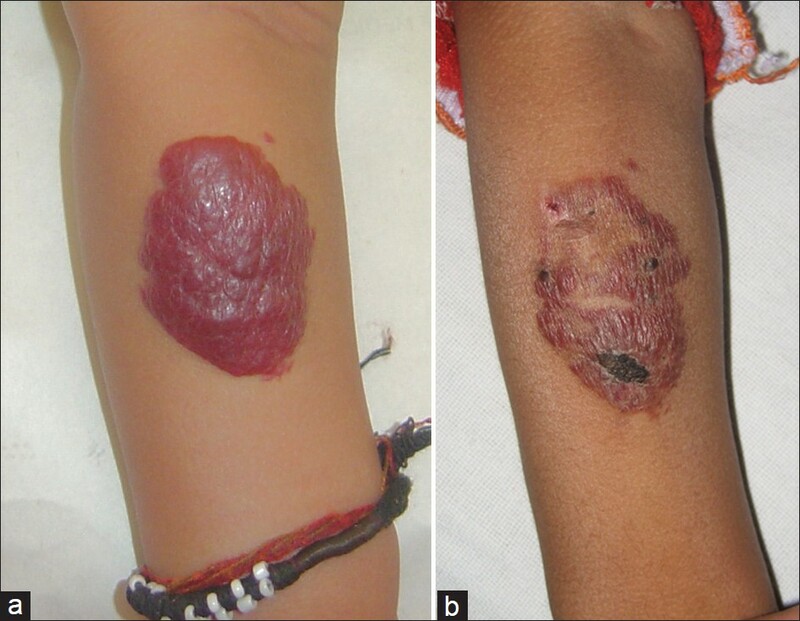 Scarring is the most common complication reported in dermatological literature. However, given the high efficacy, ease of treatment, and added advantage of avoiding the side effects of systemic agents, sclerotherapy alone may be considered a useful modality. This is especially true for large, exuberant and pedunculated lesions, which are likely to leave behind loose, redundant, sac-like tissue, upon regression. An early, proactive approach in such cases can lead to an improved outcome and preclude the use of extensive surgical modalities later on. 1. Marler JJ, Mulliken JB. Vascular anomalies: Classification, diagnosis and natural history. Facial Plast Surg Clin North Am 2001;9:495-504. 2. Mulliken JB, Fishman SJ, Burrows PE. Vascular anomalies. Curr Probl Surg 2000;37:517-84. 3. Grover C, Kedar A, Arora P, Lal B. Efficacy of oral prednisolone use in the treatment of infantile haemangiomas in Indian children. Pediatr Dermatol 2011;28:502-6. 4. Grover C, Arora P, Kedar A, Pal P, Lal B. Combination of oral corticosteroids and Polidocanolsclerotherapy in the management infantile haemangiomas. Dermatol Surg 2010;36:2030-6. 5. Hochman M, Adams DM, Reeves TD. Current knowledge and management of vascular anomalies: I. Haemangiomas. Arch Facial Plast Surg 2011;13:145-51. 6. Andrews JC, Kelly RJ. Treatment of vascular nevi by injecting of sclerosant solutions. Arch Dermatol & Syph 1932;26:92-4. 7. Kaessler HW. Vascular birthmarks: Treatment with injection of sclerosing solution. J Am Med Assoc 1938;1101644-7. 8. Winter H, Dräger E, Sterry W. Sclerotherapy for treatment of haemangiomas. Dermatol Surg 2000;26:105-8. 9. Ratnavel GR. Foam sclerotherapy in various vascular and lymphatic malformations.Indian J Dermatol Venereol Leprol 2011;77:336-8. 10. Matsumoto K, Nakanishi H, Koizumi Y, Seike T, Kanda I, Kubo Y. Sclerotherapy of haemangioma with late involution. Dermatol Surg 2003;29:668-71.